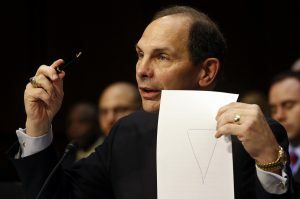 WASHINGTON — Veterans Affairs Secretary Robert McDonald said Monday that the VA should not use wait times as a measure of success, comparing waits for VA health care to the hours people wait for rides at Disney theme parks. McDonald’s comments set off a political firestorm, with Republicans denouncing the remarks as inaccurate and inappropriate. House Speaker Paul Ryan, R-Wis., called McDonald’s comments “flippant” and said they show “just how seriously the Obama administration’s VA is taking life or death problems” at the agency. “This is not make-believe, Mr. Secretary. Veterans have died waiting in those lines,” Ryan said on Twitter. McDonald took office in July 2014 after his predecessor was forced out amid a scandal over chronically long wait times at VA health care sites and reports that as many as 40 patients died while awaiting care at the Phoenix VA hospital. Similar problems were discovered at VA health sites nationwide, along with a widespread practice among VA employees of creating secret lists to cover up the long wait times and receive VA bonuses. “There is nothing amusing about VA’s performance over the past few years, and comparing VA wait times to those of an amusement park is just plain wrong,” said Rep. Jeff Miller, R-Fla., chairman of the House veterans panel. Sen. John McCain, R-Ariz., chairman of the Senate Armed Services Committee and a longtime veterans’ advocate, called McDonald’s comment “outrageous and completely inappropriate,” especially since McDonald himself is an Army veteran. VA spokeswoman Victoria Dillon said in a statement late Monday that officials know that veterans are still waiting too long for care. “In our effort to determine how we can better meet veterans’ needs — knowing that their satisfaction is our most important measure — we have heard them tell us that wait times alone are not the only indication of their experience with VA and that’s why we must transform the way we do business,” Dillon said.